I really enjoy the letters and photos I receive from poodle puppies I've bred and their families. So I've decided to start collecting them on this page. Our Princess is 4 years old today. She is absolutely the love of our life and our older 14 year old poodle adores her. We are so fortunate to know you and we wanted you to enjoy her special day also. God Bless you and thank you for our special Angel! We took her to the mountain for the snow. We don't have snow in Palo Alto. Hope all is well with you an your furry family. 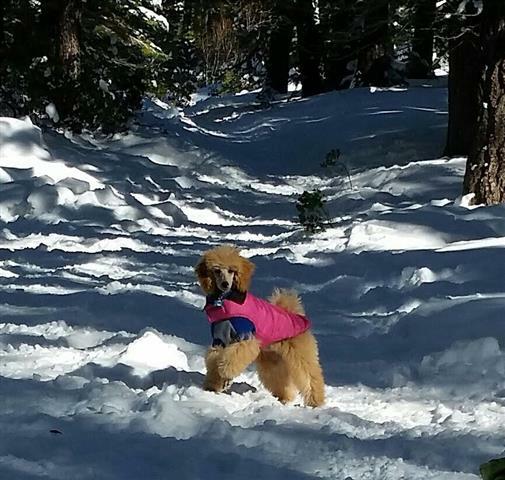 We can not express our love and gratitude for our fabulous four year old Remy Poodle. She has brought us so much joy. She is the Queen of the neighborhood and everybody loves her. She gets along wonderfully with our older 14year old Miranda brown poodle. We appreciate you so much and wish you all the blessings of Easter and Springtime. Remy wanted to show you her Christmas dress and her Easter pajamas. Miranda is an old girl and won't tolerate the fuss but they love each other. I have a Billy grandson, Ricky, and he's one of the best dogs I've ever owned. He's extremely intelligent, loyal, fun loving, and just plain happy all the time, which is infectious. He's also healthy and sound. Just great. Congratulations Barbara, your Billy is one of the best ever! I also happen to be a dog trainer, and Ricky goes around with me to schools and nursing homes, he does "trick shows" and just plain brings happiness to people wherever he goes. They give us so much joy and companionship.